Seven candles are lit. Keroppi blew 5 out but after a minute, Pochacco lit 3 of them. After that, Keroppi blew 4 candles out then Pochacco lit 1 of them up. How many candles remain? KEY LETTER: The last letter of the answer to this puzzle is a key letter to the main puzzle! Congratulations! You’ve found the 4th subpuzzle! Please remember to visit the main blog again tomorrow to solve the next subpuzzle! We hope you get all the correct key letters! 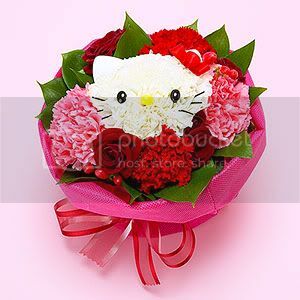 Hello Kitty Flowers for Mother’s Day! Mother’s day is celebrated on May (in most countries), but Sanrio has already released pre-order forms of one of the best gifts for any mother who is a Hello Kitty Fan: a cute bouquet of Hello Kitty’s Face! This limited offer will only be available to 150 customers and will be sold through “first come, first serve” basis. Need an organizer that will help keep your things in place even if you’re always on the go? 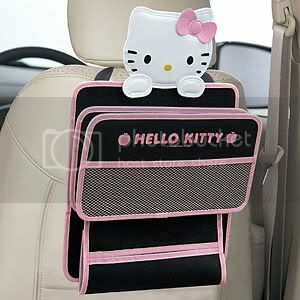 Let the Hello Kitty Multiple Pocket Car Organizer do the job for you! Put your make-up, tissue box, CDs, drinking bottles and other stuff in it that you need to bring on your trip. With this, you won’t forget to bring important documents and personal possessions again when you travel to different places! From the popular Japanese Drama Gokusen comes a Hello Kitty Pen Gokusen Edition! 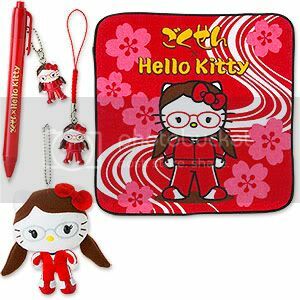 Hello Kitty is dressed like Yankumi, the drama’s main character, and she’s ready to help you write smoothly on your notebook! Hello Kitty resembles her so much its just so cute! 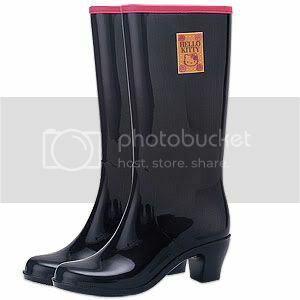 Pair up your Hello Kitty Umbrella with this cool Hello Kitty rain boots! The boots have a nice, slick texture that will surely keep rain water away. It also comes with a cute Hello Kitty design that will keep you fashionable even under heavy rain!